Like many women, I dye my hair. While color treatments are notorious for damaging hair and sometimes having frighteningly inconsistent results, I take a few precautions to guard against color disasters. I use a shower filter, which helps to reduce mineral deposits and exposure to chlorine. I also am fond of a great henna dye that won't strip my natural color. Yet even these measures are sometimes not enough. If you're looking for consistent, deep color, you can try a pre-treatment such as Malibu C Color Prepare. 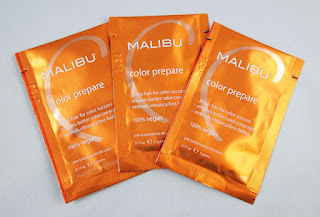 Malibu C Color Prepare helped my color application go more smoothly than usual. I was surprised by the depth of my color, which turned a rich mahogany that I hadn't been able to achieve before. Just be sure that you are ready for a darker/deeper color than you might otherwise get from the same dye, as the color prepare was quite effective. I was glad to see that this rated an extremely low 0 on EWG's Skin Deep database, indicating that the ingredients are very gentle. I love how these simple packets are easy to apply and are both vegan and gluten-free. The only downside I found was that they are not sold in regular retail stores, so you'll have to use the salon locator or buy direct from Malibu C. If you're looking for a gentle way to boost your color application, Color Prepare is a great option.